A man with a vendetta against the Church admitted breaking into dozens of churches and threatening to punch a priest during a four-month crime spree across Victoria. Source: The Age. The man, aged in his fifties, pleaded guilty to 54 charges in the County Court yesterday, over the January to April offending. When interviewed by police he said he had been sexually abused by priests for three months as a child. “The burglaries were not about money, but were about retribution for what they do to people,” the man told officers in April. 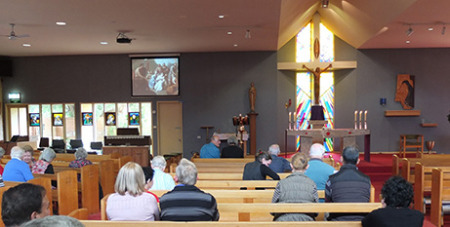 The thief left his wallet behind during one of the burglaries at Ringwood’s Lady of Perpetual Help Church presbytery in April, which was found by a priest, according to a prosecution summary. He returned and threatened Fr Anthony Dolan, who heard the front gate rattle, telling him: “I’m going to punch your f---ing lights out”. The priest begged him “please don’t do that”, before the man jumped the fence and fled. He also threatened to kill a female cleaner who discovered him at the Parish of Our Lady Church in Balwyn. The man pleaded guilty to 16 burglaries, 15 aggravated burglaries, one attempted aggravated burglary, an attempted burglary and 19 thefts at Catholic buildings across regional Victoria and Melbourne. He also pleaded guilty to making threat to inflict serious injury and threat to kill.